Another trip to Green Hill. I really like this spot along the RI coast, especially when it is void of it's summer inhabitants. The surf was up but so was the wind and the clouds! 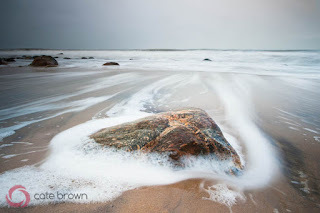 It was a chilly winter storm and I didn't know what I would get with regard to seascapes. I went with zero preconceived ideas or expectations, just hoping the scenery would guide my creativity. I first thought to walk west along the beach but ended up walking east instead. I looked around for Sandy debris to photograph but came to the rocks as usual. I don't know what it is about rocks, the primeval honesty of them, but they always make great photography subjects. For anyone who has seen my Green Hill photography before might recognize some of the mineral bands in this rock in particular! It was the main subject in a sunset seascape shoot which illuminated most of the rocks a brilliant shade of green. This time, I decided on a closer composition than usual, making the rock more of my focus compared to the entire landscape. 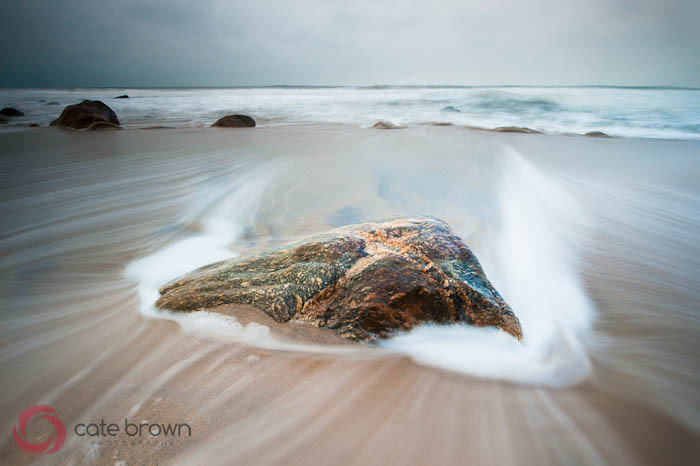 Here's a couple of versions of the same rock with different long exposure effects from the water. The first one is my favorite but the sea foam and bubbles in the second image are terrific too! These exposures are all between 1-2 seconds long to create the leading lines from the receding water.